Phylogenetic analysis of representative groups of ants in the subfamily Pseudomyrmecinae indicates that specialized relationships with domatia-bearing plants have evolved independently at least 12 times within the subfamily (Ward, 1991). The plants involved in such associations include swollen-thorn acacias in Mexico and Central America; Neotropical trees in the genera Cordia, Myrcia, Tachigali and Triplaris; African species of Acacia, Barteria and Vitex; a Malagasy species of Mimosa; and an Australian tree in the genus Cupaniopsis. In most instances the plant provides some kind of intrinsically hollow, or easily excavated, cavity (domatium) in which the ants keep brood and scale insects (Coccoidea). The ants, in turn, protect the host plant from herbivores and (sometimes) from other competing plants. In the case of the interaction between Pseudomyrmex ants and swollen-thorn acacias, scale insects are absent from the domatia, but the ants receive nutritional rewards from extrafloral nectaries on the leaf petiole and from lipid-rich food bodies (Beltian bodies) produced at the leaf tips. Table 1. The obligate plant-ants in the subfamily Pseudomyrmecinae (from Ward, 1991, 1993, 1999b). 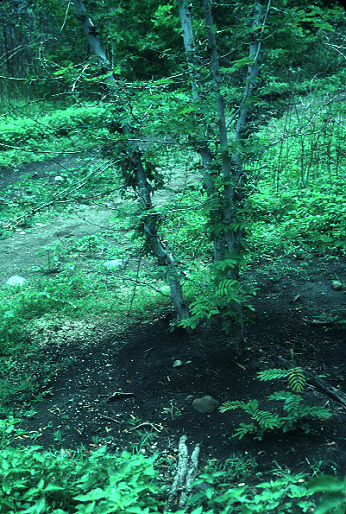 These are species which, as far as known, nest only in live plant domatia. Taxa identified only by a code number (e.g., Pseudomyrmex sp. PSW-35) represent undescribed species whose descriptions and new names will be found in Ward (1999b). Myrcidris epicharis Brazil Myrcia sp. For general reviews on the interactions between ants and domatia-bearing plants see Beattie (1985), Benson (1985), Davidson & McKey (1993), and Wheeler (1942). 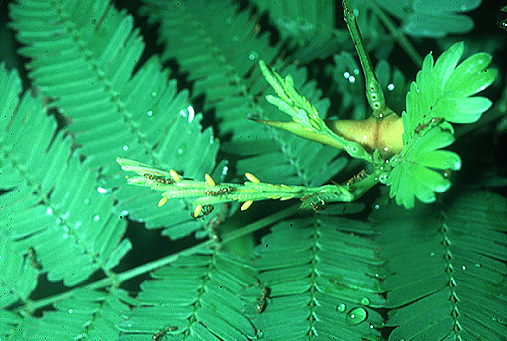 Identification keys are available for the Pseudomyrmex species inhabiting swollen-thorn acacias (Ward, 1993) and Triplaris and Tachigali plants (Ward, 1999b). Problematic specimens of Pseudomyrmex may be sent for identification to: Philip S. Ward, Department of Entomology, University of California, One Shields Ave., Davis, CA 95616, USA. Beattie, A. J. 1985. The evolutionary ecology of ant-plant mutualisms. New York: Cambridge University Press, 182 pp. Benson, W. W. 1985. Amazon ant-plants. Pp. 239-266 in: Prance, G. T., Lovejoy, T. E. (eds.) Key environments. Amazonia. Oxford: Pergamon Press, xiv + 442 pp. Ward, P. S. 1991. Phylogenetic analysis of pseudomyrmecine ants associated with domatia-bearing plants. Pp. 335-352 in: Huxley, C. R., Cutler, D. F. (eds.) Ant-plant interactions. Oxford: Oxford University Press, xviii + 601 pp. Ward, P. S. 1993. Systematic studies on Pseudomyrmex acacia-ants (Hymenoptera: Formicidae: Pseudomyrmecinae). J. Hym. Res. 2:117-168. Ward, P. S. 1999b. Systematics, biogeography and host plant associations of the Pseudomyrmex viduus group (Hymenoptera: Formicidae), Triplaris– and Tachigali-inhabiting ants. Zool. J. Linn. Soc. 126:451-540. Ward, P. S. 2001. Taxonomy, phylogeny and biogeography of the ant genus Tetraponera (Hymenoptera: Formicidae) in the Oriental and Australian regions. Invert. Taxon. 15:589-665. Wheeler, W. M. 1942. Studies of Neotropical ant-plants and their ants. Bull. Mus. Comp. Zool. 90:1-262.